In the past two hundred years, the world has changed profoundly. With the beginning of the Industrial Revolution, the world has witnessed an explosion in the numbers of fossil fuel consuming machines. Something dramatic happened when you consider that in the year 1890 there were no automobiles on the road, but a hundred years later literally a billion cars belched carbon into the air. Humans have grown accustomed to incredibly high levels of consumption, an unprecedented break from eons of human tradition. Population has also exploded, which, when combined with our vastly expanded appetites, has produced cities of gargantuan size, overwhelming millions of acres of once fertile land with concrete. With the final realization that something must be done to counter the effects of global warming, our global woodlands stand as a central solutions. Many of the world's natural, old growth forests have long ago been logged off. If the forests were allowed to reforest naturally, the environmental impact would be a minimal. However, for a number of reasons reforestation has been stymied. But it is not just the forests that suffer. Without forests, soil tends to erode; water quality declines; and eventually the land can no longer support the indigenous population. 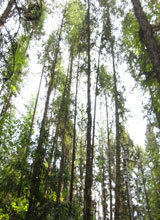 Another advantage of vigorous reforestation is that forests can capture carbon. If science proves that carbon is a source of global warming, then reforestation may be one of the answers to preserving our natural environment and avoiding the disruptive consequences of rapid climate change. saving natural forests from logging, clear-cutting and burning. RTI: Plant Health with advanced nutrients containing mycorrhiza fungi.